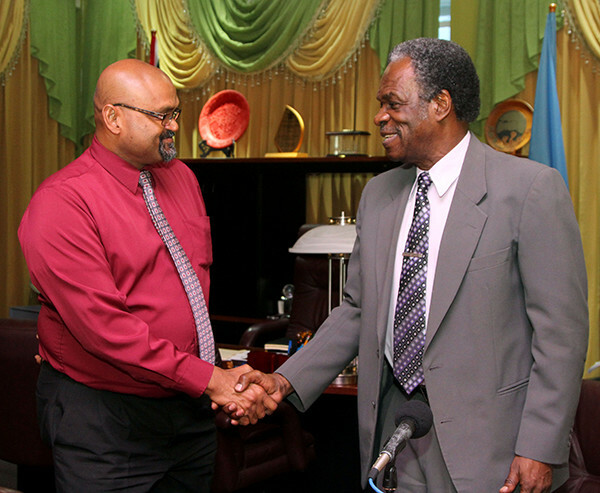 T&TEC Manager of Tobago Operations Ganesh Narine and THA Chief Secretary Orville London. Chief Secretary Orville London is pleased with the progress being made by the Trinidad and Tobago Electricity Commission (T&TEC) to bring a more reliable supply of electricity to northeast Tobago. London met with officials from T&TEC on Thursday (July 16, 2015) at the Administrative Complex, Calder Hall, to get an update on infrastructural upgrades the Commission has been carrying out in the area. He was also encouraged with the progress being made. The Commission has also had some challenges in providing streetlights to some of these areas, London said. “T&TEC indicated that they’ve been plagued by the unavailability of adequate resources, including manpower and materials,” he stated. London said the THA will be reviewing the needs of electoral districts across the island. The Division of Infrastructure and Public Utilities will also meet with T&TEC to address the issues of individual communities. London said the Assembly, which is responsible for the costing of the lights, wants an “efficient and effective roll-out” of the streetlights. The Chief Secretary praised T&TEC for its timeliness and the quality of its responses, in recent times, to requests from THA Divisions, including the Division of Community Development and Culture, which was connected last week. The Division had previously been operating on a generator.